The history of High Bridge is intertwined with the development of the iron and steel industry in the United States. As early as the 1700s, the framework of this little hamlet had already been created by English investors who carved up the rich wilderness of the New World, brimming with iron ore that would be essential to the county's development. High Bridge Borough evolved around the Taylor Wharton Foundry, established in 1742. With the passage of time, however, High Bridge has lost its farming and foundry roots, evolving into what is often referred to as a bedroom community. Just like the lofty trestle from which High Bridge derived its name, the city now runs the risk of being lost to time, forsaking the resilient character of the immigrants who forged a nation. 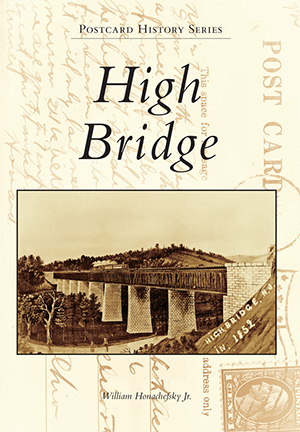 This book aims to preserve High Bridge's glorious history for future generations. William Honachefsky Jr. is a lifelong resident of Hunterdon County and a passionate advocate for the protection of the state's natural environment and historic heritage. He has served on the New Jersey 350th Commission and Union Forge Heritage Association, among others.